There was a man of venerable life, blessed by grace, and blessed in name, for he was called "Benedictus" or Benedict. From his younger years, he always had the mind of an old man; for his age was inferior to his virtue. All vain pleasure he despised, and though he was in the world, and might freely have enjoyed such commodities as it yields, yet he esteemed it and its vanities as nothing. Therefore, giving over his book, and forsaking his father's house and wealth, with a resolute mind only to serve God, he sought for some place, where he might attain to the desire of his holy purpose. In this way he departed, instructed with learned ignorance, and furnished with unlearned wisdom. All the notable things and acts of his life I could not learn; but those few, which I mind now to report, I had by the relation of four of his disciples; namely, Constantinus, a most rare and reverent man, who was next Abbot after him; Valentinianus, who for many years had the charge of the Lateran Abbey; Simplicius, who was the third superior of his order; and lastly of Honoratus, who is now Abbot of that monastery in which he first began his holy life. CHAPTER ONE: HOW HE MADE A BROKEN SIEVE WHOLE AND SOUND. Benedict having now given over the school, with a resolute mind to lead his life in the wilderness: his nurse alone, who tenderly loved him, would not by any means give him over. Coming, therefore, to a place called Enside and remaining there in the church of St. Peter, in the company of other virtuous men, which for charity lived in that place, it fell so out that his nurse borrowed of the neighbors a sieve to make clean wheat, which being left negligently on the table, by chance it was broken in two pieces, Whereupon she fell pitifully weeping, because she had borrowed it. The devout and religious youth Benedict, seeing his nurse so lamenting, moved with compassion, took away with him both the pieces of the sieve, and with tears fell to his prayers; and after he had done, rising up he found it so whole, that the place could not be seen where before it was broken. Coming straight to his nurse, and comforting her with good words, he delivered her the sieve safe and sound: which miracle was known to all the inhabitants thereabout, and so much admired, that the townsmen, for a perpetual memory, hanged it up at the church door, to the end that not only men then living, but also their posterity might understand, how greatly God's grace worked with him on his first renouncing of the world. The sieve continued there many years after, even to these very troubles of the Lombards, where it hung over the church door. But Benedict, desiring rather the miseries of the world than the praises of men: rather to be wearied with labor for God's sake, than to be exalted with transitory commendation: fled privately from his nurse, and went into a desert place called Subiaco, distant almost forty miles from Rome: in which there was a fountain springing forth cool and clear water; the abundance whereof does first in a broad place make a lake, and afterward running forward, comes to be a river. As he was travelling to this place, a certain monk called Romanus met him, and demanded whither he went, and understanding his purpose, he both kept it close, furnished him what he might, vested him with the habit of holy conversation, and as he could, ministered and served him. And because from Romanus' cell to that cave there was not any way, by reason of a high rock which hung over it, Romanus, from the top thereof, on a long rope, let down the loaf, on which also with a band he tied a little bell, that by the ringing of it the man of God might know when he came with his bread, and so be ready to take it. But the old enemy of mankind, envious of the charity of the one and the refection of the other, seeing a loaf on a certain day let down, threw a stone and broke the bell. Yet, for all that, Romanus did not cease to serve Benedict by all the possible means he could. At length when almighty God was determined to ease Romanus of his pains, and to have Benedict's life for an example known to the world, that such a candle, set on a candlestick, might shine and give light to the Church of God, our Lord vouchsafed to appear to a certain Priest dwelling a good way off, who had made ready his dinner for Easter day. He spoke thus to him: "Thou have provided good cheer for thyself, and my servant in such a place is afflicted with hunger." Hearing this, the priest rose up, and on Easter day itself, with such meat as he had prepared, went to the place, where he sought for the man of God among the steep hills, the low valleys and hollow pits, and at length found him in his cave. After they had prayed together, and sitting down had given God thanks, and had much spiritual talk, then the Priest said to him: "Rise up, brother, and let us dine, because today is the feast of Easter." The man of God answered, and said: "I know that it is Easter with me and a great feast, having found so much favor at God's hands as this day to enjoy your company" (for by reason of his long absence from men, he knew not that it was the great solemnity of Easter). But the reverent Priest again assured him, saying: "Verily, today is the feast of our Lord's Resurrection, and therefore it is not right that you should keep abstinence. Besides I am sent to that end, that we might eat together of such provision as God's goodness hath sent us." Whereupon they said grace, and fell to their meat, and after they had dined, and bestowed some time in talking, the Priest returned to his church. About the same time likewise, certain shepherds found him in that same cave: and at the first, when they spied him through the bushes, and saw his apparel made of skins, they thought that it had been some beast. After they were acquainted with the servant of God, however, many of them were by his means converted from their beastly life to grace, piety, and devotion. Thus his name in the country there about became famous, and many after this went to visit him, and in exchange for corporal meat which they brought him, they carried away spiritual food for their souls. On a certain day being alone, the tempter was at hand: for a little black bird, commonly called a merle or an ousel, began to fly about his face, and that so near as the holy man, if he would, might have taken it with his hand: but after he had blessed himself with the sign of the cross, the bird flew away: and forthwith the holy man was assaulted with such a terrible temptation of the flesh, as he never felt the like in all his life. A certain woman there was which some time he had seen, the memory of which the wicked spirit put into his mind, and by the representation of her so mightily inflamed with concupiscence the soul of God's servant, which so increased that, almost overcome with pleasure, he was of mind to have forsaken the wilderness. But, suddenly assisted with God's grace, he came to himself; and seeing many thick briers and nettle bushes to grow hard by, off he cast his apparel, and threw himself into the midst of them, and there wallowed so long that, when he rose up, all his flesh was pitifully torn. So, by the wounds of his body, he cured the wounds of his soul, in that he turned pleasure into pain, and by the outward burning of extreme smart, quenched that fire which, being nourished before with the fuel of carnal cogitations, inwardly burned in his soul: and by this means he overcame the sin, because he made a change of the fire. GREGORY: It is plain, Peter, that in youth the temptation of the flesh is hot: but after fifty years the heat of the body waxes cold, and the souls of faithful people become holy vessels. Wherefore necessary it is that God's elect servants, whiles they are yet in the heat of temptation, should live in obedience, serve, and be wearied with labor and pains. But when, by reason of age, the heat of temptation is past, they become keepers of holy vessels; because they then are made the doctors of men's souls. PETER: I cannot deny, but that your words have given me full satisfaction: wherefore, seeing you have now expounded the meaning of the former text alleged, prosecute, I pray, as you have begun, the rest of the holy man's life. CHAPTER THREE: HOW BENEDICT, BY THE SIGN OF THE HOLY CROSS, BROKE A DRINKING-GLASS IN PIECES. 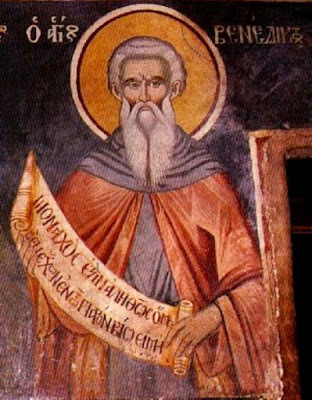 GREGORY: When this great temptation was thus overcome, the man of God, like to a piece of ground well tilled and weeded, of the seed of virtue brought forth plentiful store of fruit: and by reason of the great report of his wonderful holy life, his name became very famous. Not far from the place where he remained there was a monastery, the Abbot whereof was dead: whereupon the whole Convent came to the venerable man Benedict, entreating him very earnestly that he would vouchsafe to take on him the charge and government of their Abbey: long time he denied them, saying that their manners were divers from his, and therefore that they should never agree together: yet at length, overcome with their entreaty, he gave his consent. Having now taken on him the charge of the Abbey, he took order that regular life should be observed, so that none of them could, as before they used, through unlawful acts decline from the path of holy conversation, either on the one side or on the other: which the monks perceiving, they fell into a great rage, accusing themselves that ever they desired him to be their Abbot, seeing their crooked conditions could not endure his virtuous kind of government. Therefore, when they saw that under him they could not live in unlawful sort, and were loath to leave their former conversation, and found it hard to be enforced with old minds to meditate and think on new things: and because the life of virtuous men is always grievous to those that be of wicked conditions, some of them began to devise, how they might rid him out of the way. "Almighty God have mercy on you, and forgive you: why have you used me in this manner? Did not I tell you before hand, that our manner of living could never agree together? Go your ways, and seek ye out some other father suitable to your own conditions, for I intend not now to stay any longer among you." When he had thus discharged himself, he returned to the wilderness which so much he loved, and dwelt alone with himself, in the sight of his Creator, who beholds the hearts of all men. PETER: I do not understand very well what you mean, when you say that he dwelt with himself. 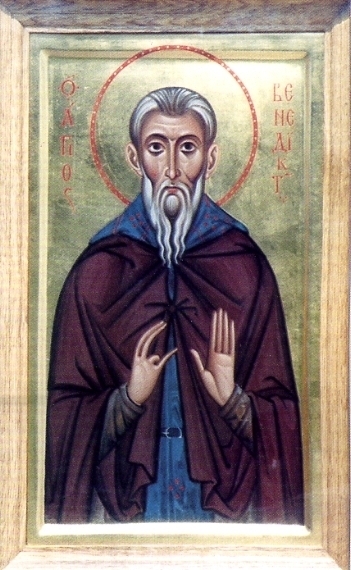 GREGORY: If the holy man had longer, contrary to his own mind, continued his government over those monks, who had all conspired against him, and were far unlike him in life and conversation, perhaps he should have diminished his own devotion, and somewhat withdrawn the eyes of his soul from the light of contemplation. Being wearied daily with correcting of their faults, he would have had the less care of himself, and so it might have fallen out that he should have both lost himself, and yet not found them. For so often as by infectious motion we are carried too far from ourselves, we remain the same men that we were before, and yet not with ourselves as we were before: because we are wandering about other men's affairs, little considering and looking into the state of our own soul. If then, before he was with himself, from where did he return home to himself? 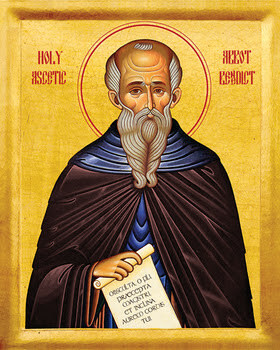 Therefore I said that this venerable man dwelt with himself, because carrying himself circumspectly and carefully in the sight of his Creator, always considering his own actions, always examining himself, he never turned the eyes of his soul from himself, to behold whatsoever else. GREGORY: We are two manner of ways, Peter, carried out of ourselves: for either we fall under ourselves by sinful cogitation, or else we are, by the grace of contemplation, lifted above ourselves. He that kept hogs, through wanderings of his mind and unclean thoughts, fell under himself, He whom the Angel delivered out of prison, being also rapt by the Angel into an ecstasy, was in truth out of himself, but yet above himself. Both of them, therefore, returned to themselves; the one when he recollected himself, and forsook his lewd kind of life; and the other from the top of contemplation, to have that usual judgment and understanding, which before he had. 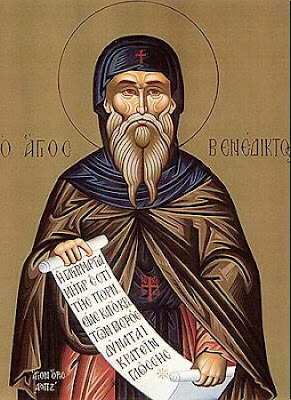 Therefore, venerable Benedict in that solitary wilderness dwelt with himself, because he kept himself, and retired his cogitations within the closet of his own soul: for when the greatness of contemplation rapt him up aloft, out of all question he then left himself under himself. PETER: Your discourse does very well content me: yet I beseech you to answer me this question, whether he could in conscience give over those monks, whose government he had now taken on him? GREGORY: In my opinion, Peter, evil men may with good conscience be tolerated in that community, where there be some good that may be helped, and reap spiritual profit. Where there is none good at all that receive spiritual profit, often times all labor is lost. Those that would be perfect carry always this mind: that when they perceive their labor to be fruitless in one place, to remove immediately to another, where more good may be done. What then? shall we say that Paul was afraid of death, when as himself said, that he desired it for Christ's sake? not so: but when he perceived that in that place little good was to be done by great labor, he reserved himself for further labor, where more fruit and better success might be expected. Therefore the valiant soldier of Christ would not be kept within walls, but sought for a larger field where he might more freely labor for his master. And so, in like manner, you shall quickly perceive, if you mark well, that venerable Benedict forsook not so many in one place, that were unwilling to be taught, as he in sundry other places raised up from the death of soul many more, that were willing to be instructed. PETER: It is just as you say, and plain reason teaches it, and the example of St. Paul confirms it. I beseech you, however, to return to your former purpose, and to continue telling the life of the holy man. GREGORY: As God's servant daily increased in virtue and became continually more famous for miracles, many were led by him to the service of almighty God in the same place. By Christ's assistance he built there twelve Abbeys; over which he appointed governors, and in each of them placed twelve monks. A few he kept with himself; namely, those he thought would gain more profit and be better instructed by his own presence. At that time also many noble and religious men of Rome came to him, and committed their children to be brought up under him for the service of God. Evitius delivered Maurus to him, and Tertullius, the Senator, brought Placidus. These were their sons of great hope and promise: of the two, Maurus, growing to great virtue, began to be his master's helper; but Placidus, as yet, was but a boy of tender years. CHAPTER FOUR: HOW BENEDICT REFORMED A MONK THAT WOULD NOT STAY AT HIS PRAYERS. Among the monasteries which he had built in those parts, three of them were situated on the rocks of a mountain, so that it was very painful for the monks to go down and fetch water, especially because the side of the hill was so steep that there was great fear of danger. Therefore the monks of those Abbeys with one consent came to the servant of God, Benedict, giving him to understand, how laborious it was for them daily to go down to the lake for water. They added that it was very necessary for them to move to some other places. The man of God, comforting them with sweet words, caused them to return. The next night, having with him only the little boy Placidus (of whom we spoke above), he ascended up to the rock of that mountain, and continued there a long time in prayer. When he had done, he took three stones, and laid them in the same place for a mark, and so, none of them being privy to what he had done, he returned to his own Abbey. The next day, when the foresaid monks came again about their former business, he said to them: "Go your way to the rock, and in the place where you find three stones laid one on another, dig a little hole, for almighty God is able to bring forth water in the top of that mountain, and so ease you of that great labor of fetching it so far." Away they went, and came to the rock of the mountain according to his directions. They found it as if it were sweating drops of water. After they had made a hollow place with a spade, it was immediately filled, and water flowed out abundantly. So plentifully, that even to this day, the water springs out and runs down from the top of that hill to the very bottom. At another time, a certain Goth, poor of spirit, that gave over the world, was received by the man of God; whom on a day he commanded to take a bill, and to cleanse a certain plot of ground from briers, for the making of a garden, which ground was by the side of a lake. The Goth as he was there laboring, by chance the head of the bill slipped off, and fell into the water, which was so deep, that there was no hope ever to get it again. The poor Goth, in great fear, ran to Maurus and told him what he had lost, confessing his own fault and negligence: Maurus forthwith went to the servant of God, giving him to understand thereof, who came immediately to the lake: and took the handle out of the Goth's hand, and put it into the water, and the iron head by and by ascended from the bottom and entered again into the handle of the bill, which he delivered to the Goth, saying: "Behold here is thy bill again, work on, and be sad no more." On a certain day, as venerable Benedict was, in his cell, young Placidus, the holy man's monk, went out to take up water at the lake, and putting down his pail carelessly, fell in after it. The water forthwith carried him away from the land as far as one may shoot an arrow. The man of God, being in his cell, by and by knew this. He called in haste for Maurus, saying: "Brother Maurus, run as fast as you can, for Placidus, who went to the lake to fetch water, has fallen in, and is carried a good way off." A strange thing, and since the time of Peter the Apostle never heard of! Maurus asked his father's blessing and, departing in all haste at his command, ran to that spot on the water, to which the young lad had been carried by the force of the water. Thinking that he had all that while been on the land, Maurus took fast hold of Placidus by the hair of his head, in all haste he returned with him. As soon as he was on land, coming to himself, he looked back, and then knew very well that he had run on the water. That which before he dared not to presume, being now done and past, he both marveled and was afraid of what he had done. 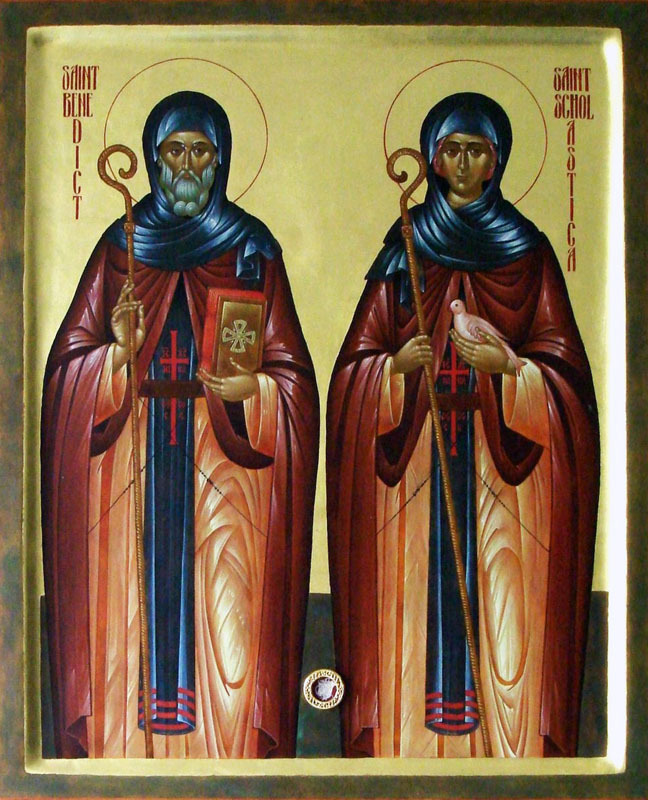 Coming back to the father, Benedict, and telling him what had happened, the venerable man did not attribute this to his own merits, but to the obedience of Maurus. Maurus, on the contrary, said that it was done only on his commandment, and that he had nothing to do in that miracle, not knowing at that time what he did. The friendly contention proceeded in mutual humility, but the youth himself that had been saved from drowning determined the fact. He said that when he was drawn out of the water, he saw the Abbot's garment on his head, affirming thereby that it was the man of God that had delivered him from that great danger. PETER: Certainly these are wonderful things that you report, and they may serve for the edification of many. For my own part, the more that I hear of his miracles, the more do I desire to hear. GREGORY: When as the foresaid monasteries were zealous in the love of our Lord Jesus Christ, and their fame dispersed far and near, and many gave over the secular life, and subdued the passions of their soul, under the light yoke of our Saviour: then (as the manner of wicked people is, to envy at that virtue which themselves desire not to follow) one Florentius, Priest of a church nearby, and grandfather to Florentius our sub-deacon, possessed with diabolical malice, began to envy the holy man's virtues, to back-bite his manner of living, and to withdraw as many as he could from going to visit him. In conclusion so much did malicious envy blind him, and so far did he wade in that sin, that he poisoned a loaf and sent it to the servant of almighty God, as it were for a holy present. The man of God received it with great thanks, yet not ignorant of that which was hidden within. At dinner time, a crow daily used to come to him from the next wood, which took bread at his hands; coming that day after his manner, the man of God threw him the loaf which the Priest had sent him, giving him this charge: "In the name of Jesus Christ our Lord, take up that loaf, and leave it in some such place where no man may find it." Then the crow, opening his mouth, and lifting up his wings, began to hop up and down about the loaf, and after his manner to cry out, as though he would have said that he was willing to obey, and yet could not do what he was commanded. The man of God again and again bide him, saying: "Take it up without fear, and throw it where no man may find it." At length, with much ado, the crow took it up, and flew away, and after three hours, having dispatched the loaf, he returned again, and received his usual allowance from the man of God. But the venerable father, perceiving the Priest so wickedly bent against his life, was far more sorry for him than grieved for himself. And Florentius, seeing that he could not kill the body of the master, attempts to do now what he can, to destroy the souls of his disciples; and for that purpose he sent into the yard of the Abbey before their eyes seven naked young women, which there took hands together, play and dance a long time before them, to the end that, by this means, they might inflame their minds to sinful lust: which damnable sight the holy man beholding out of his cell, and fearing the danger which thereby might ensue to his younger monks, and considering that all this was done only for his persecution, he gave place to envy; and therefore, after he had for those abbeys and oratories which he had there built appointed governors, and left some under their charge, himself, in the company of a few monks, removed to another place. And thus the man of God, on humility, gave place to the other's malice; but yet almighty God of justice severely punished [Florentius'] wickedness. For when the foresaid Priest, being in his chamber, understood of the departure of holy Benedict, and was very glad of that news, behold (the whole house besides continuing safe and sound) that chamber alone in which he was, fell down, and so killed him: which strange accident the holy man's disciple Maurus understanding, immediately sent him word, he being as yet scarce ten miles off, desiring him to return again, because the Priest that persecuted him was slain; which thing when Benedict heard, he was passing sorrowful, and lamented much: both because his enemy died in such sort, and also for that one of his monks rejoiced thereat; and therefore he gave him penance, for that, sending such news, he presumed to rejoice at his enemy's death. PETER: The things you report are strange, and much to be wondered at. In making the rock to yield water, I see Moses; and in the iron, which came from the bottom of the lake, I behold Elisha; in the walking of Maurus on the water, I perceive Peter; in the obedience of the crow, I contemplate Elias; and in lamenting the death of his enemy, I acknowledge David: and therefore, in my opinion, this one man was full of the spirit of all good men. 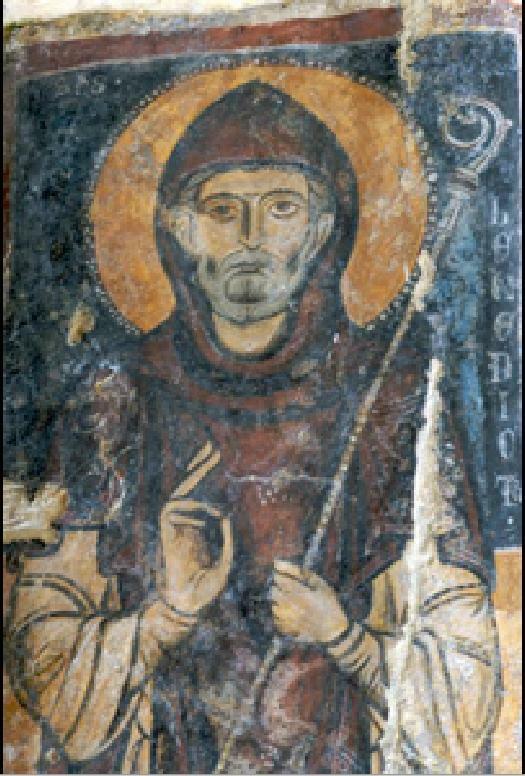 GREGORY: The man of god, Benedict, had the spirit of the one true God, who, by the grace of our redemption, hath filled the hearts of his elect servants; of whom St. John says: "He was the true light, which does lighten every man coming into this world," [John 1:9]. Of whom, again, we find it written: "Of his fullness we have all received," [John 1:16]. For God's holy servants might receive virtues from our Lord, but to bestow them on others they could not. Therefore it was he that gave the signs of miracles to his servants, who promised to give the sign of Jonas to his enemies [Matt. 12:40]. He died in the sight of the proud, to rise again before the eyes of the humble so that they might behold what they spurned, and those see that which they ought to worship and love. By reason of this mystery it comes to pass that, whereas the proud cast their eyes on the contempt of his death, the humble contrariwise, against death, lay hold of the glory of his power and might. PETER: To what places, I pray you, after this, did the holy man go: and did he work any miracles afterward or not? GREGORY: The holy man, changing his place, not for all that changed his enemy. For afterward he endured so much the more grievous battles, by how much he had now the master of all wickedness fighting openly against him. For the town, which is called Cassino, stands on the side of a high mountain, which contains, as it were in the lap thereof, the foresaid town, and afterward so rises in height the space of three miles, that the top thereof seems to touch the very heavens. In this place there was an ancient chapel in which the foolish and simple country people, according to the custom of the old gentiles, worshipped the god Apollo. Round about it likewise on all sides, there were woods for the service of the devils, in which even to that very time, the mad multitude of infidels offered most wicked sacrifice. The man of God coming there, beat the idol into pieces, overthrew the altar, set fire to the woods, and in the temple of Apollo, he built the oratory of St. Martin, and where the altar of the same Apollo was, he made an oratory of St. John. By his continual preaching, he brought the people dwelling in those parts to embrace the faith of Christ. The old enemy of mankind, not taking this in good spirit, presented himself to the eyes of that holy father, not privately or in a dream, but in open sight. With great outcries the devil complained that Benedict had offered him violence. The noise which he made, the monks heard, but the enemy they could not see. The venerable father told them he appeared visibly to him most foul and cruel, and as though, with his fiery mouth and flaming eyes, he would have torn him in pieces. What the devil said to him, all the monks heard; for first he would call him by his name, and because the man of God did not answer him, then would he fall reviling and railing at him. When he cried out, calling him "Blessed Benedict," and yet found that he gave him no answer, immediately he would turn his tune, and say: "Cursed Benedict, and not blessed: what have you to do with me? and why do you thus persecute me?" Wherefore new battles of the old enemy against the servant of God are to be looked for, against whom willingly he made war, but, against his will, he gave him occasion of many notable victories. 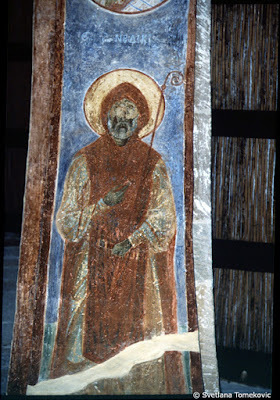 CHAPTER NINE: HOW VENERABLE BENEDICT, BY HIS PRAYER, REMOVED A HUGE STONE. Then the man of God thought it good that they should presently dig up the ground in the same place before his departure. This was done, and a deep hole made, the monks found there an idol of brass, which being for a little while by chance cast into the kitchen, they beheld fire suddenly to come from it, which to all their sight seemed to set the whole kitchen on fire. For the quenching of it, the monks by casting on of water made such a noise, that the man of God, hearing it, came to see what the matter was. He himself beheld not any fire at all, but they said that they did. He bowed down his head forthwith in prayer, and then he perceived that they were deluded with a fantastical fire. He therefore bide them bless their eyes, that they might behold the kitchen safe and sound, and not those fantastical flames, which the devil had falsely devised. CHAPTER ELEVEN: HOW VENERABLE BENEDICT REVIVED A BOY, CRUSHED TO DEATH WITH THE RUIN OF A WALL. Again, as the monks were making of a certain wall somewhat higher, because that was requisite, the man of God in the meantime was in his cell at his prayers. To whom the old enemy appeared in an insulting manner, telling him, that he was now going to his monks, that were at work: whereof the man of God, in all haste, gave them warning, wishing them to look to themselves, because the devil was at that time coming among them. The message was scarce delivered, when as the wicked spirit overthrew the new wall which they were a building, and with the fall slew a little young child, a monk, who was the son of a certain courtier. At which pitiful chance all were passing sorry and exceedingly grieved, not so much for the loss of the wall, as for the death of their brother: and in all haste they sent this heavy news to the venerable man Benedict; who commanded them to bring to him the young boy, mangled and maimed as he was, which they did, but yet they could not carry him any otherwise than in a sack: for the stones of the wall had not only broken his limbs, but also his very bones. Being in that manner brought to the man of God, he bid them to lay him in his cell, and in that place on which he used to pray; and then, putting them all forth, he shut the door, and fell more instantly to his prayers than he used at other times. And O strange miracle! for the very same hour he made him sound, and as lively as ever he was before; and sent him again to his former work, that he also might help the monks to make an end of that wall, of whose death the old serpent thought he should have insulted over Benedict, and greatly triumphed. CHAPTER TWELVE: HOW BY REVELATION VENERABLE BENEDICT KNEW THAT HIS MONKS HAD EATEN OUT OF THE MONASTERY. Among other miracles which the man of God did, he began also to be famous for the spirit of prophecy: as to foretell what was to happen, and to relate to them that were present, such things as were done in absence. The order of his Abbey was, that when the monks went abroad (to deliver any message) never to eat or drink anything out of their cloister: and this being diligently observed, according to the prescription of their rule, on a certain day some of the monks went forth on such business: and being enforced about the dispatch thereof to tarry somewhat long abroad, it fell so out that they stayed at the house of a religious woman, where they ate and refreshed themselves. And being late before they came back to the Abbey, they went as the manner was, and asked their father's blessing: of whom he demanded where they had eaten: and they said nowhere. "Why do you," said he, "tell an untruth? for did you not go into such a woman's house? and eat such and such kind of meat, and drink so many cups?" When they heard him recount so in particular, both where they had stayed, what kind of meat they had eaten, and how often they had drunk, and perceived well that he knew all whatsoever they had done, they fell down trembling at his feet, and confessed that they had done wickedly: who immediately pardoned them for that fault, persuading himself that they would not any more in his absence presume to do any such thing, seeing they now perceived that he was present with them in spirit. A brother also of Valentinian the monk, of whom I made mention before, was a layman, but devout and religious: who used every year, as well to desire the prayers of God's servant, as also to visit his natural brother, to travel from his own house to the Abbey: and his manner was, not to eat anything all that day before he came thither. Being therefore on a time in his journey, he lighted into the company of another that carried meat about him to eat by the way: who, after the day was well spent, spoke to him in this manner: "Come, brother," said he, "let us refresh ourselves, that we faint not in our journey": to whom he answered: "God forbid: for eat I will not by any means, seeing I am now going to the venerable father Benedict, and my custom is to fast until I see him." The other, on this answer, said no more for the space of an hour. But afterward, having travelled a little further again he was in hand with him to eat something: yet then likewise he utterly refused, because he meant to go through fasting as he was. His companion was content, and so went forward with him, without taking anything himself. But when they had now gone very far, and were well wearied with long travelling, at length they came to a meadow, where there was a fountain, and all such other pleasant things as use to refresh men's bodies. Then his companion said to him again: "Behold here is water, a green meadow, and a very sweet place, in which we may refresh ourselves and rest a little, that we may be the better able to dispatch the rest of our journey." 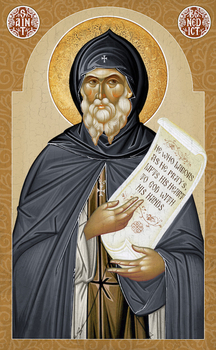 Which kind words bewitching his ears, and the pleasant place flattering his eyes, content he was to yield to the motion, and so they fell to their meat together: and coming afterward in the evening to the Abbey, they brought him to the venerable father Benedict, of whom he desired his blessing. Then the holy man objected against him what he had done in the way, speaking to him in this manner: "How fell it out, brother," said he, "that the devil talking to you, by means of your companion, could not at the first nor second time persuade you: but yet he did at the third, and made you do what best pleased him?" The good man, hearing these words, fell down at his feet, confessing the fault of his frailty; was grieved, and so much the more ashamed of his sin, because he perceived that though he were absent, that yet he offended in the sight of that venerable father. PETER: I see well that the holy man had in his soul the spirit of Elisha, who was present with his servant Giezi, being then absent from him. CHAPTER FOURTEEN: HOW THE DISSIMULATION OF KING TOTILA WAS DISCOVERED AND FOUND OUT BY VENERABLE BENEDICT. GREGORY: You must, good Peter, for a little while be silent, that you may know matters yet far more important. 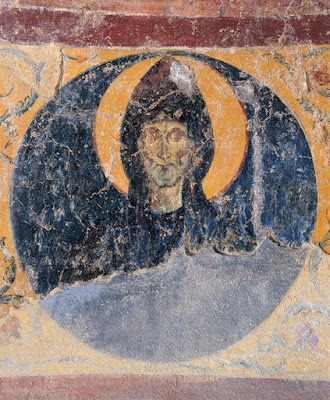 For in the time of the Goths, when Totila, their king, understood that the holy man had the spirit of prophecy, as he was going towards his monastery, he remained in a place somewhat far off, and beforehand sent the father word of his coming: to whom answer was returned, that he might come at his pleasure. The king, as he was a man wickedly disposed, thought he would try whether the man of God were a prophet, as it was reported, or no. A certain man of his guard he had, called Riggo, on whom he caused his own shoes to be put, and to be appareled with his other princely robes, commanding him to go as it were himself to the man of God; and to give the better color to this device, he sent three to attend on him, who especially were always about the king: to wit, Vultericus, Rudericus, and Blindinus; charging them that in the presence of the servant of God, they should be next about him, and behave themselves in such sort as though he had been king Totila indeed: and that diligently they should do to him all other services, to the end that both by such dutiful kind of behavior, as also by his purple robes, he might verily be taken for the king himself. Riggo, furnished with that brave apparel, and accompanied with many courtiers, came to the Abbey. At that time the man of God sat a little way off, and when Riggo was come so near that he might well understand what the man of God said, then, in the hearing of them all, he spoke thus: "Put off, my good son, put off that apparel, for what you have on, is not yours." Riggo, hearing this, fell immediately down to the ground, and was very much afraid, for presuming to go about to mock so worthy a man, and all his attendants and servitors fell down likewise to the earth, and after they were up again, they dare not approach any nearer to his presence: but returned to their king, telling him with fear, how quickly they were discovered. CHAPTER FIFTEEN: HOW VENERABLE BENEDICT PROPHESIED TO KING TOTILA, AND ALSO TO THE BISHOP OF CAMISINA, SUCH THINGS AS WERE AFTERWARD TO FALL OUT. 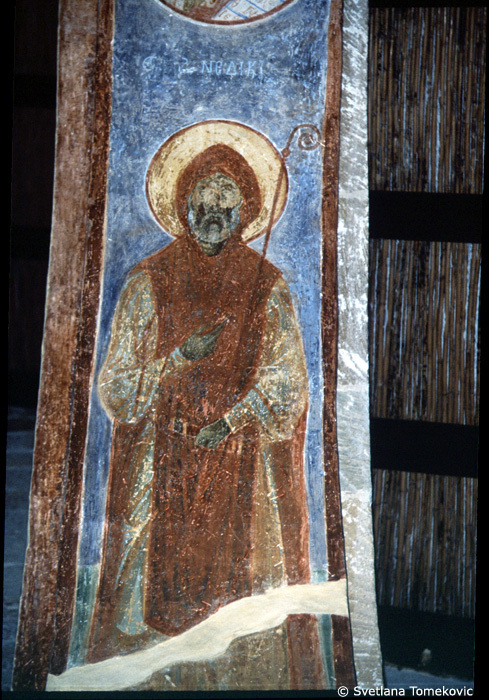 Then Totila himself in person went to the man of God; and seeing him sitting afar off, he dare not come near, but fell down to the ground: whom the holy man (speaking to him twice or thrice) desired to rise up and at length came to him, and with his own hands lifted him up from the earth, where he lay prostrate: and then, entering into talk, he reprehended him for his wicked deeds, and in few words told him all that which should befall him, saying: "Much wickedness do you daily commit, and many great sins have you done: now at length give over your sinful life. Into the city of Rome shall you enter, and over the sea shall you pass: nine years shall you reign, and in the tenth shall you leave this mortal life." The king, hearing these things, was wonderfully afraid, and desiring the holy man to commend him to God in his prayers, he departed: and from that time forward he was nothing so cruel as before he had been. Not long after he went to Rome, sailed over into Sicily, and, in the tenth year of his reign, he lost his kingdom together with his life. 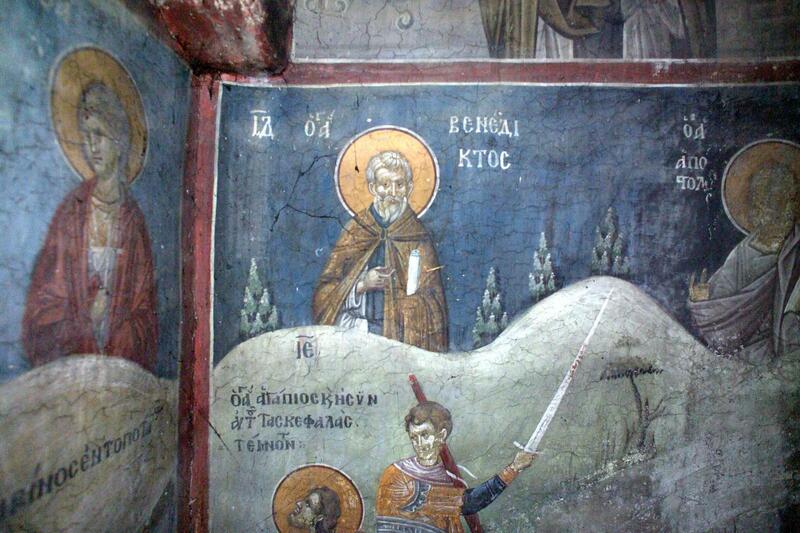 The Bishop also of Camisina used to visit the servant of God, whom the holy man dearly loved for his virtuous life. The Bishop, therefore, talking with him of King Totila, of his taking of Rome, and the destruction of that city, said: "This city will be so spoiled and ruined by him, that it will never be more inhabited." To whom the man of God answered: "Rome," said he, "shall not be utterly destroyed by strangers: but shall be so shaken with tempests, lightnings, whirlwinds, and earthquakes, that it will fall to decay of itself." The mysteries of which prophecy we now behold as clear as the day: for we see before our eyes in this very city, by a strange whirlwind the world shaken, houses ruined, and churches overthrown, and buildings rotten with old age we behold daily to fall down. True it is that Honoratus, by whose relation I had this, says not that he received it from his own mouth, but that he had it of other monks, which heard it themselves. CHAPTER SIXTEEN: OF A CERTAIN CLERGYMAN, WHOM VENERABLE BENEDICT FOR A TIME DELIVERED FROM A DEVIL. At the same time a certain clergyman, that served in the church of Aquinum, was possessed: whom the venerable man Constantius, Bishop of the same city, sent to many places of holy martyrs for help: but God's holy martyrs would not deliver him, to the end that the world might know what great grace was in the servant of God, Benedict: wherefore at length he was brought to him, who, praying for help to Jesus Christ our Lord, forthwith cast the old enemy out of the possessed man's body, giving him this charge: "Go your way, and hereafter abstain from eating of flesh, and presume not to enter into holy orders, for whenever you shall attempt any such thing, the devil again will have power over you." The man departed safe and sound, and because punishment fresh in memory used to terrify the mind, he observed for a time what the man of God had given him in commandment. But after many years, when all his seniors were dead, and he saw his juniors preferred before him to holy orders, he neglected the words of the man of God, as though forgotten through length of time, and took on him holy orders: whereupon immediately the devil that before had left him entered again, and never ceased to torment him, until he had separated his soul from his body. 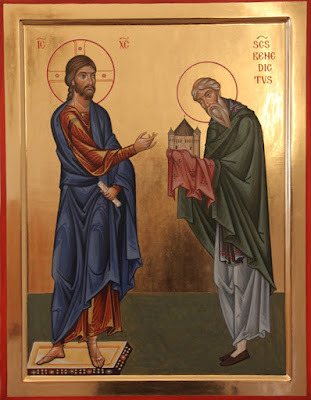 PETER: This holy man, as I perceive, knew the secret counsel of God: for he saw that this clergyman was delivered to the power of the devil, to the end he should not presume to enter into holy orders. PETER: If he that cleaves to our Lord, be one spirit with our Lord, what is the meaning of that which the Apostle says: "Who knows the sense of our Lord, or who hath been his counselor?" [Rom. 11:34], for it seems very inconvenient to be ignorant of his sense, to whom being so united he is made one thing. And again, whiles I am thus speaking of this matter, another question comes to my mind: for the prophet David said to our Lord: "With my lips have I uttered all the judgments of thy mouth," [Ps. 118 (119):13]. Wherefore, seeing it is less to know, than to utter: what is the reason that St. Paul affirmed the judgments of God to be incomprehensible; and yet David said that he did not know only them, but also with his lips pronounce them? GREGORY: To both these questions I have already briefly answered, when I said that holy men, in that they be one with our Lord, are not ignorant of the sense of our Lord. For all such, as do devoutly follow our Lord, be also by devotion one with our Lord; and yet for all this, in that they are laden with the burden of their corruptible flesh, they be not with God: and so in that they be joined with him, they know the secret judgments of God, and in that they be separated from God, they know them not: for seeing they do not as yet perfectly penetrate his secret mysteries, they give testimony that his judgments be incomprehensible. But those that adhere to him with their soul, and cleaving to the sayings of the holy scripture, or to secret revelations, acknowledge what they receive: such persons both know these things and do utter them: for those judgments which God does conceal they know not, and those which he does utter they know: and therefore the prophet David, when he had said: "I have with my lips uttered all the judgments;" [Ps. 118(119):13], he added immediately, "of thy mouth," as though he should plainly say: Those judgments I may both know and utter, which I knew you spoke, for those things which you do not speak, without all question, you conceal from our knowledge. Wherefore the saying of David and St. Paul agree together: for the judgments of God are incomprehensible; and yet those which himself with his own mouth deigned to speak, are uttered with men's tongues: because men may come to the knowledge of them, and being revealed, they may be uttered, and by no means can be kept secret. PETER: Now I see the answer to my question. But I pray you to proceed, if anything yet remains to be told of his virtue and miracles. CHAPTER SEVENTEEN: HOW THE MAN OF GOD, BENEDICT, DID FORETELL THE SUPPRESSION OF ONE OF HIS OWN ABBEYS. GREGORY: A certain noble man called Theoprobus was converted by the good counsel of holy Benedict. On account of his virtue and merit of life, he was very familiar with him. This man one day, coming into his cell, found Benedict weeping very bitterly. And having waited expectantly a good while, and yet not seeing him end (for the man of God used not in his prayers to weep, but rather to be sad), he demanded the cause of his great heaviness. He answered straightway, saying, "All this Abbey which I have built, and all such things as I have made ready for my brethren, are by the judgment of almighty God delivered to the gentiles, to be spoiled and overthrown. I could but barely obtain of God to have the lives spared of those monks that should then be living in it." The words Theoprobus then heard, we see to have been proved most true. We know the Abbey is now suppressed by the Lombards. For not long before, in the night time, when the monks were asleep, they entered in, and spoiled all things, but not one man could they keep there. Thus almighty God fulfilled what he promised to his faithful servant: for though he gave them the house and all the goods, yet he preserved their lives. In which thing I see that Benedict imitated St. Paul: though his ship lost all its goods, he had the lives of all that were in his company given to him, so that none on board was cast away. CHAPTER EIGHTEEN: HOW BLESSED BENEDICT KNEW THE HIDING AWAY OF A FLAGON OF WINE. Once upon a time, Exhilaratus, our monk, a lay-brother, whom you know, was sent by his master to the monastery of the man of God, to carry to him two wooden bottles, commonly called flagons, full of wine. The servant, as he was going, hid one of them in a bush for himself, and presented the other to venerable Benedict. He took it very thankfully, and, when the man was going away, he gave him this warning: "Take heed, my son," said he, "that you don't drink of that flagon which you have hidden in the bush. First be careful to examine it, and you shall then find what is within it." The poor man, thus pitifully confounded by the man of God, went his way, and coming back to the place where the flagon was hidden, and desirous to try the truth of what was told him, as he examined the flagon, a snake immediately leaped forth. Then Exhilaratus, perceiving what had gotten into the wine, began to be afraid of the wickedness that he had committed. Not far from his Abbey, there was a village, in which very many men had, by the sermons of Benedict, been converted from idolatry to the true faith of Christ. Certain Nuns also there were in the same town, to whom he often sent some of his monks to preach to them, for the good of their souls. On a day, one that was sent, after he had made an end of his exhortation, by the entreaty of the Nuns took certain small napkins, and hid them for his own use in his bosom: whom, on his return to the Abbey, the man of God very sharply rebuked, saying: "How comes it to pass, brother, that sin is entered into your bosom ?" At which words the monk was much amazed for he had quite forgotten what he had put there; and therefore knew not any cause why he should deserve that reprehension: whereupon the holy man spoke to him in plain terms, and said: "Was not I present when you took the handkerchiefs of the Nuns, and put them up in your bosom for your own private use?" The monk, hearing this, fell down at his feet, and was sorry that he had behaved himself so indiscreetly: forth he drew those napkins from his bosom, and threw them all away. CHAPTER TWENTY: HOW HOLY BENEDICT KNEW THE PROUD THOUGHT OF ONE OF HIS MONKS. Once upon a time, while the venerable Father was at supper, one of his monks, who was the son of a great man, held the candle. As he was standing there, and the other ate his meal, he began to entertain a proud thought in his mind. He spoke to himself: "Who is he, that I wait on him at supper and hold him the candle? and who am I, that I should do him any such service?" Immediately the holy man turned and with severe rebuke spoke to him: "Sign your heart, brother, for what is it that you say? Sign your heart." Forthwith he called another of the monks, and bid him take the candle out of his hands. He commanded him to cease his waiting, and to retire. 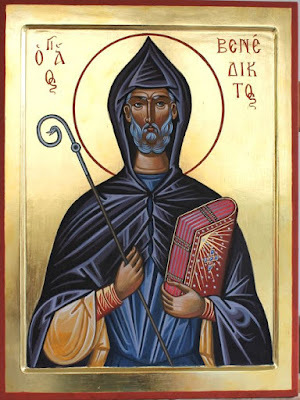 Benedict, being demanded of the monks what it was that he had thought, told them, how inwardly that monk had swelled with pride, and what he spoke against the man of God, secretly in his heart. Then they all realized very well that nothing could be hidden from venerable Benedict, seeing that the very sound of men's inward thoughts came to his ears. CHAPTER TWENTY-ONE: OF TWO HUNDRED BUSHELS OF MEAL, FOUND BEFORE THE MAN OF GOD'S CELL. At another time, there was a great dearth in the same country of Campania: so that all kind of people tasted of the misery: and all the wheat of Benedict's monastery was spent, and likewise all the bread, so that there remained no more than five loaves for dinner. The venerable man, beholding the monks sad, both rebuked them modestly for their pusillanimity, and again comforted them with a promise. "Why," said he, "are you so grieved in your minds for lack of bread? Indeed, today there is some want, but tomorrow you shall have plenty." And so it fell out, for the next day two hundred bushels of meal were found in sacks before his cell door, which almighty God sent them: but by whom, or what means, that is unknown to this very day: which miracle when the monks saw, they gave God thanks, and by this learned in want, not to make any doubt of plenty. GREGORY: The spirit of prophecy does not always illuminate the minds of the prophets; because, as it is written of the Holy Ghost that "he breathes where he will" [John 3:8], so we are also to know that he does breathe likewise for what cause, and when he pleases. And hereof it comes, that when king David demanded of Nathan whether he might build a temple for the honor of God, the prophet Nathan gave his consent; and yet afterward utterly forbid it. From hence likewise it proceeds that, when Elisha saw the woman weeping, and knew not the cause, he said to his servant that troubled her: "Let her alone, for her soul is in grief, and God hath concealed it from me, and hath not told me" [4 Kings 4:27]. Which thing almighty God of great piety so disposes: for giving at some times the spirit of prophecy, and at other times withdrawing it, he does both lift up the prophets minds on high, and yet does preserve them in humility: that by the gift of the Spirit, they may know what they are by God's grace: and at other times, destitute of the same Spirit, may understand what they are of themselves. PETER: There is very great reason in what you say. But, I pray you, let me hear more of the venerable man Benedict, if there be anything else that comes to your remembrance. CHAPTER TWENTY-TWO: HOW, BY VISION, VENERABLE BENEDICT DISPOSED THE BUILDING OF THE ABBEY OF TERRACINA. GREGORY: At another time he was asked by a certain virtuous man, to build an Abbey for his monks on his property, not far from the city of Terracina. The holy man agreed, and appointed an Abbot and Prior, with diverse monks under them. When they were departing, he promised that, on such a day, he would come and show them in what place the oratory should be made, and where the refectory should stand, and all the other necessary rooms. So they, taking his blessing, went their way; and on the day appointed, which they had greatly expected, they made all such things ready as were necessary to entertain him and those that would come in his company. But the very night before, the man of God appeared to the Abbot and the Prior while they slept, and described particularly where each place and office was to be built. When they both rose from sleep, they conferred together what each of them had seen in their sleep. Not yet giving full credit to that vision, they expected the man of God himself in person, according to his promise. But when they saw that he did not come, they went to him very sorrowfully, saying: "We expected, father, that you would have come as you promised, and tell us where each place should have been built, yet you did not." To them he answered: "Why do you say so, good brethren? Did I not come as I promised you?" And when they asked at what time it was, he said, "Why, did not I appear to each of you in your sleep, and appoint how and where every place was to be built? Go your way, and according to that plan that you then saw, build up the abbey." At which word they much marveled, and returning, they built the abbey in such as way as they had been taught by his revelation. GREGORY: Why do you, Peter, seek out and doubt, in what manner this thing was done? For certain it is, that the soul is of a more noble nature than the body. And by authority of scripture we know that the prophet Habakkuk was carried from Judea with that dinner that he had, and was suddenly set in Chaldea; by which meat the prophet Daniel was relieved: and presently after was brought back again to Judea. If, then, Habakkuk could in a moment with his body go so far, and carry provision for another man's dinner: what marvel is it, if the holy father Benedict obtained grace to go in spirit and to inform the souls of his brethren that were asleep, concerning such things as were necessary: and that as Habakkuk about corporal meat went corporally, so Benedict should go spiritually about the dispatch of spiritual business? GREGORY: His common talk, Peter, was usually full of virtue: for his heart conversed to above in heaven, that no words could in vain proceed from his mouth. And if at any time he spoke aught, yet not as one that determined what was best to be done, but only in a threatening manner, his speech in that case was so effectual and forcible, as though he had not doubtfully or uncertainly, but assuredly pronounced and given sentence. For not far from his Abbey, there lived two Nuns in a place by themselves, born of worshipful parentage: whom a religious good man served for the dispatch of their outward business. But as nobility of family does in some breed ignobility of mind, and makes them in conversation to show less humility, because they remember still what superiority they had above others: even so was it with these Nuns: for they had not yet learned to temper their tongues, and keep them under with the bridle of their habit: for often by their indiscreet speech they provoked the aforesaid religious man to anger; who having borne with them a long time, at length he complained to the man of God, and told him with what reproachful words they entreated him: whereupon he sent them by and by this message, saying: "Amend your tongues, otherwise I do excommunicate you"; which sentence of excommunication notwithstanding, he did not then presently pronounce against them, but only threatened if they amended not themselves. But they, for all this, changed their conditions nothing at all: both which not long after departed this life, and were buried in the church: and when solemn mass was celebrated in the same church, and the Deacon, according to custom, said with loud voice: "If any there be that do not communicate, let them depart": the nurse, which used to give to our Lord an offering for them, beheld them at that time to rise out of their graves, and to depart the church. Having often times, at those words of the Deacon, seen them leave the church, and that they could not tarry within, she remembered what message the man of God sent them whiles they were yet alive. For he told them that he deprived them of the communion, unless they amended their tongues and conditions. Then with great sorrow, the whole matter was signified to the man of God, who immediately with his own hands gave an oblation, saying: "Go your ways, and cause this to be offered to our Lord for them, and they shall not remain any longer excommunicate": which oblation being offered for them, and the Deacon, as he used, crying out, that such as did not communicate should depart, they were not seen any more to go out of the church: whereby it was certain that, seeing they did not depart with them who did not communicate, that they had received the communion of our Lord by the hands of his servant. GREGORY: Was he not yet, Peter, mortal, that heard from our Saviour: "Whatsoever you shall bind on earth, it shall be bound also in the heavens: and whatsoever you shall loose in earth, shall be loosed also in the heavens?" [Matt. 16:19] whose place of binding and loosing those have at this time, which by faith and virtuous life possess the place of holy government: and to bestow such power on earthly men, the Creator of heaven and earth descended from heaven to earth: and that flesh might judge of spiritual things, God, who for man's sake was made flesh, vouchsafed to bestow on him: for from there our weakness rose up above itself, from where the strength of God was weakened under itself. GREGORY: On a certain day, a young boy that was a monk, loving his parents more than reason would allow, went from the Abbey to their house, without asking the holy father's blessing beforehand. The same day that he came home to them, he departed this life. Being buried, the next day after, his body was found cast out of the grave. They caused it to be put back in, but again, the day following, they found it as before. CHAPTER TWENTY-FIVE: HOW A MONK, FORSAKING THE ABBEY, MET WITH A DRAGON ON THE WAY. GREGORY: A certain monk there was so inconstant and fickle of mind, that he desired to leave the Abbey. For this fault of his, the man of God daily rebuked him, and often times gave him good admonitions. But yet, for all this, he would by no means tarry among them, and therefore continually begged that he might be discharged. The venerable man, wearied with his importunity, in anger bid him depart. He was no sooner out of the Abbey gate, when he found a dragon in the way waiting for him with open mouth. About to be devoured, he began in great fear and trembling to cry out aloud, saying, "Help, help! for this dragon will eat me up." At the noise the monks ran out, but they saw no dragon, only the reluctant monk, shaking and trembling. They brought him back again to the Abbey. 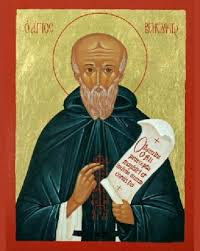 He forthwith promised that he would never more forsake the monastery, and so ever after he continued in his profession. By the prayers of the holy man, he saw the dragon coming against him, whom before, when he did not see him, he had willingly followed. 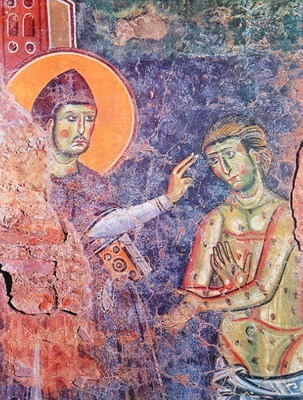 CHAPTER TWENTY-SIX: HOW HOLY BENEDICT CURED A BOY OF LEPROSY. But I must not here pass over with silence that which I had by relation of the honorable man, Anthony, who said that his father's boy was so pitifully punished with a leprosy, that all his hair fell off, his body swelled, and filthy corruption openly came forth. Who being sent by his father to the man of God, he was by him quickly restored to his former health. CHAPTER TWENTY-SEVEN: HOW BENEDICT FOUND MONEY MIRACULOUSLY TO RELIEVE A POOR MAN. Neither is that to be omitted, which one of his disciples called Peregrinus used to tell: for he said that, on a certain day, an honest man, who was in debt, found no other means to help himself, but thought it his best way to acquaint the man of God with his necessity: whereupon he came to the Abbey, and finding the servant of almighty God, gave him to understand, how he was troubled by his creditor for twelve shillings which he owed him. To whom the venerable man said that himself had not so much money, yet giving him comfortable words, he said: "Go your ways, and after two days come to me again, for I can not presently help you": in which two days, after his manner, he bestowed himself in prayer: and when on the third day the poor man came back there were found suddenly on the chest of the Abbey, which was full of corn, thirteen shillings: which the man of God caused to be given to him that required but twelve, both to discharge his debt, and also to defray his own charges. But now will I return to speak of such things as I had from the mouth of his own scholars, mentioned before in the beginning of this book. A certain man there was who had an enemy that notably spited and maligned him, whose damnable hatred proceeded so far that he poisoned his drink, which, although it killed him not, yet it changed his skin in such sort that it was of many colors, as though he had been infected with a leprosy: but the man of God restored him to his former health: for so soon as he touched him, forthwith all that variety of colors departed from his body. At such time as there was a great dearth in Campania, the man of God had given away all the wealth of the Abbey to poor people, so that in the cellar there was nothing left but a little oil in a glass. A certain sub-deacon called Agapitus came to him, instantly craving that he would bestow a little oil on him. Our Lord's servant, who was resolved to give away all on earth that he might find all in heaven, commanded that the oil be given him. The monk that kept the cellar, however, heard what the father commanded, yet he did not perform it. Inquiring not long after whether he had given that which he commanded, the monk told him that he had not, adding that if he had given it away, that there was not to be any left for the Convent. Then in an anger he commanded others to take that glass with the oil, and to throw it out at the window, to the end that nothing might remain in the Abbey contrary to obedience. The monks did so, and threw it out at a window, under which there was a huge downfall, full of rough and craggy stones on which the glass landed, but yet continued for all that so sound as though it had never been thrown out at all, for neither the glass was broken nor any of the oil shed. Then the man of God commanded it to be taken up again, and, whole as it was, to be given to him that desired it, and in the presence of the other brethren he reprehended the disobedient monk, both for his infidelity, and also for his proud mind. After which reprehension, with the rest of his brethren he fell to praying, and in the place where they were, there stood an empty barrel with a cover on it: and as the holy man continued in his prayers, the oil within so increased, that the cover began to be lifted up, and at length fell down, and the oil, that was now higher than the mouth of the barrel, began to run over on the pavement, which so soon as the servant of God, Benedict, beheld, forthwith he gave over his prayers, and the oil likewise ceased to overflow the barrel. Then he admonished that mistrusting and disobedient monk, that he would learn to have faith and humility, who on so wholesome an admonition was ashamed, because the venerable father had by miracle shown the power of almighty God, as before he told him when he first rebuked him: and so no cause there was why any should afterward doubt of his promise, seeing at one and the same time, for a small glass almost empty which he gave away, he bestowed on them an whole barrel full of oil. CHAPTER THIRTY: HOW BENEDICT DELIVERED A MONK FROM THE DEVIL. Once upon a time, as he was going to the oratory of St. John, which is at the top of the mountain, the old enemy of mankind on a mule, like a physician, met him, carrying in his hand a horn and a mortar. And when he demanded where he was going: "To your monks," said he, "to give them a drench" [i.e. a large dose of veterinary medicine]. The venerable father went forward to his prayers, and when he had done, he returned in all haste, but the wicked spirit found an old monk drawing water, into whom he entered, and immediately cast him on the ground, and grievously tormented him. The man of God coming from his prayers, and seeing him in such pitiful case gave him only a little blow with his hand, and at the same instant he cast out that cruel devil, so that he dare not any more presume to enter in. GREGORY: Such are the devout servants of God, that when necessity requires, they work miracles both manner of ways. Sometimes they effect wonderful things by their prayers, and sometimes only by their power and authority. St. John says: "So many as received him, he gave them power to be made the sons of God" [John 1:12]. They, then, that by power are the sons of God, what marvel is it, if by power they are able to do wonderful things? And that both ways they work miracles, we learn from St. Peter who by his prayers raised up Tabitha; and by his sharp reprehension sentenced Ananias and Sapphira to death for their lying. For we do not read that in the death of them he prayed at all, but only rebuked them for that sin which they had committed. It is therefore certain that sometimes they do these things by power, and sometimes by prayer: for Ananias and Sapphira by a severe rebuke, St. Peter deprived of life: and by prayer restored Tabitha to life. For proof of this, I will now tell you about two miracles that the faithful servant of God, Benedict, did, in which it shall appear most plainly that he wrought the one by that power which God gave him, and obtained the other by virtue of his prayers. CHAPTER THIRTY-ONE: OF A COUNTRY FELLOW, THAT, WITH THE ONLY SIGHT OF THE MAN OF GOD, WAS LOOSED FROM HIS BANDS. A certain Goth there was called Galla, an Arian heretic, who, in the time of King Totila, persecuted religious people of the Catholic church with such monstrous cruelty, that when any priest or monk came into his presence, he never departed alive. This man on a certain day, set on rapine and pillage, pitifully tormented a poor country man, to make him confess where his money and wealth was. Overcome with extremity of pain, he said that he had committed all his substance to the custody of Benedict, the servant of God. He said this so that his tormentor, giving credit to his words, might at least for a while cease from his horrible cruelty. Galla, hearing this information, tormented him no longer, but binding his arms fast with strong cords, drove him before his horse, to bring him to this Benedict, who, as he said, had his wealth in his keeping. The country fellow, thus pinioned and running before him, carried him to the holy man's Abbey, where he found him sitting before the gate, reading a book. Then turning back to Galla that came raging after, he said: "This is father Benedict, of whom I told you." Galla, looking at him in a great fury, thought to deal as terribly with him as he had with others. He cried out aloud to him, saying: "Rise up, sir, rise up, and deliver to me quickly such wealth of this man's as you have in keeping." The man of God, hearing such a noise, immediately lifted up his eyes from reading, and beheld both him and the country fellow. Turning his eyes to his bands, they fell from his arms very strangely and more quickly than anyone could have undone them. Galla, seeing him so wonderfully and quickly loosed, fell a-trembling. Prostrating himself on the earth, he bowed down his cruel and stiff neck to the holy man's feet, and with humility commended himself to his prayers. But the venerable man for all this did not rise from his reading, but calling for some of his monks commanded them to let him in and to give him some meat. When he was brought back, he gave him a good lesson, admonishing him not to use any more such rigor and cruel dealing. His proud mind thus taken down, away he went, but dare not demand after that anything of the country fellow, whom the man of God, not with hands, but only with his eyes, had loosed from his bands. And this is that, Peter, which I told you, that those which in a more familiar sort serve God, do sometime, by certain power and authority bestowed on them, work miracles. For he that sitting still appeased the fury of that cruel Goth, and unloosed with his eyes those knots and cords which pinioned the innocent man's arms, plainly showed by the quickness of the miracle, that he had received power to work all that which he did. And now will I likewise tell you of another miracle, which by prayer he obtained at God's hands. CHAPTER THIRTY-TWO: HOW BY PRAYER VENERABLE BENEDICT RAISED UP A DEAD CHILD. Being on a day gone out with his monks to work in the field, a country man carrying the corpse of his dead son came to the gate of the Abbey, lamenting the loss of his child: and inquiring for holy Benedict, they told him that he was abroad with his monks in the field. Down at the gate he laid the dead body, and with great sorrow of soul ran in haste to seek out the venerable father. At the same time, the man of God was returning homeward from work with his monks: whom so soon as he saw, he [the country man] began to cry out: "Give me my son, give me my son!" The man of God, amazed at these words, stood still, and said: "What, have I taken away your son?" "No, no," said the sorrowful father, " but he is dead: come for Christ Jesus' sake and restore him to life." The servant of God, hearing him speak in that manner, and seeing his monks on compassion to solicit the poor man's suit, with great sorrow of mind he said: "Away, my good brethren, away: such miracles are not for us to work, but for the blessed Apostles: why will you lay such a burden on me, as my weakness cannot bear?" But the poor man, whom excessive grief enforced, would not give over his petition, but swore that he would never depart, except he raisee up his son. "Where is he, then?" said God's servant. He answered that his body lay at the gate of the Abbey: to which place when the man of God came with his monks, he kneeled down and lay on the body of the little child, and rising, he held up his hands towards heaven, and said: "Behold not, O Lord, my sins, but the faith of this man, that desires to have his son raised to life, and restore that soul to the body, which you have taken away." He had scarce spoken these words, and behold the soul returned again, and therewith the child's body began to tremble in such sort that all which were present beheld it in strange manner to pant and shake. Then he took it by the hand and gave it to his father, but alive and in health. Certain it is, Peter, that this miracle was not in his own power, for which prostrate on the ground he prayed so earnestly. PETER: All is most true that before you said, for what you affirmed in words, you have now verified by examples and works. But tell me, I beseech you, whether holy men can do all such things as they please, and obtain at God's hands whatsoever they desire. Therefore, by this we see, as I said before, that he would have had one thing, but he could not effect it. For if we know the venerable man's mind, there is no question but that he would have had the same fair weather to have continued as it was when he left his monastery. He found, however, that a miracle prevented his desire. A miracle that, by the power of almighty God, a woman's prayers had wrought. Is it not a thing to be marveled at, that a woman, who for a long time had not seen her brother, might do more in that instance than he could? She realized, according to the saying of St. John, "God is charity" [1 John 4:8]. Therefore, as is right, she who loved more, did more. CHAPTER THIRTY-FOUR: HOW BENEDICT SAW THE SOUL OF HIS SISTER ASCEND INTO HEAVEN. At another time, Servandus, the Deacon, and Abbot of that monastery, which in times past was founded by the noble man Liberius in the country of Campania, ordinarily used to come and visit the man of God. The reason why he came so often was because he was also a man full of heavenly doctrine. So together they two often had a spiritual conference, to the end that, although they could not perfectly feed on the celestial food of heaven, yet, by means of such sweet discourses, they might, at least, with longing and fervent desire, taste of those joys and divine delights. When it was time to go to rest, the venerable Father Benedict retired to the top of a tower, at the foot of which Servandus the Deacon was lodged. One pair of stairs went to them both. Before the tower there was a large room in which both their disciples lay. 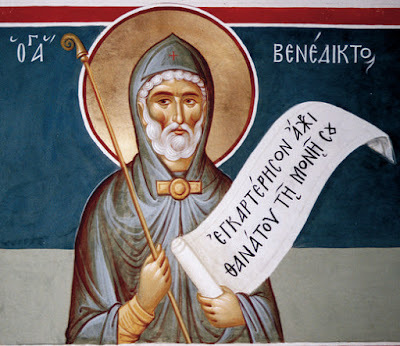 The man of God, Benedict, being diligent in watching, rose early before the time of matins (his monks being yet at rest) and came to the window of his chamber where he offered up Manuscript illustrationhis prayers to almighty God. Standing there, all of a sudden in the dead of the night, as he looked forth, he saw a light that banished away the darkness of the night and glittered with such brightness that the light which shone in the midst of darkness was far more clear than the light of the day. During this vision a marvelously strange thing followed, for, as he himself afterward reported, the whole world, gathered together, as it were, under one beam of the sun, was presented before his eyes. While the venerable father stood attentively beholding the brightness of that glittering light, he saw the soul of Germanus, Bishop of Capua, in a fiery globe, carried up by Angels into heaven. Then, desiring to have some witness of this notable miracle, he called Servandus the Deacon with a very loud voice two or three times by his name. Servandus, troubled at such an unusual crying out by the man of God, went up in all haste. Looking out the window he saw nothing else but a little remnant of the light, but he wondered at so great a miracle. The man of God told him all that he had seen in due order. In the the town of Cassino, he commanded the religious man, Theoprobus, to dispatch someone that night to the city of Capua, to learn what had become of Germanus their Bishop. This being done, the messenger learned that the reverent prelate had departed this life. Enquiring curiously the time, the messenger discovered that he died at the very instant in which the man of God beheld him ascending up to heaven. PETER: A strange thing and very much to be admired. But whereas you say that the whole world, as it were under one sunbeam, was presented before his eyes, I must confess that I never had the experience of any such thing, so I cannot conceive by what means the whole world could be seen of any one man. GREGORY: Assure yourself, Peter, of that which I speak. All creatures are, as it were, nothing to that soul that beholds the Creator. For though it sees but a glimpse of that light which is in the Creator, yet all things that are created seem very small. By means of that supernatural light, the capacity of the inward soul is enlarged, and is so extended in God, that it is far above the world. The soul of one who sees in this manner, is also above itself; for being rapt up in the light of God, it is inwardly in itself enlarged above itself. When it is so exalted and looks downward, it comprehends how little all creation is. The soul, in its former baseness, could not so comprehend. The man of God, therefore, who saw the fiery globe, and the Angels returning to heaven, could, no doubt, not see those things but in the light of God. What marvel is it, then, that he who saw the world gathered together before him -- rapt up in the light of his soul -- was at that time out of the world? Although we say that the world was gathered together before his eyes, yet it is not that heaven and earth were drawn into any lesser room than they are of themselves. The soul of the beholder was more enlarged, rapt in God, so that it might see without difficulty that which is under God. Therefore, in that light which appeared to his outward eyes, the inward light which was in his soul ravished the mind of the beholder to supernatural things and showed him how small all earthly things are. PETER: I perceive now that it is more to my profit that I did not understood you before. Noting my slow capacity, you delivered a notable exposition. But now, because you have made me thoroughly understand these things, I beseech you to continue on your former narration. CHAPTER THIRTY-SIX: HOW HOLY BENEDICT WROTE A RULE FOR HIS MONKS. GREGORY. I am desirous, Peter, to tell you many things of this venerable father, but some of purpose I let pass, because I make haste to treat also of the acts of other holy men. Yet I would not have you be ignorant of the fact that the man of God, among so many miracles for which he was so famous in the world, was also sufficiently learned in divinity. He wrote a rule for his monks, both excellent for discretion and also eloquent for its style. If any be curious to know further of his life and conversation, he may understand all his manner of life and discipline in the institution of that rule for the holy man could not otherwise teach, than he himself had lived. That day two monks, one of them at the monastery, the other some distance away, received the very same revelation. They both saw a magnificent road covered with rich carpeting and glittering with thousands of lights. From his monastery it stretched eastward in a straight line until it reached up into heaven. And there in the brightness stood a man of majestic appearance, who asked them, "Do you know who passed this way?" "This, he told them, is the road taken by blessed Benedict, the Lord's beloved, when he went to heaven." Thus, while the brethren who were with Benedict witnessed his death, those who were absent knew about it through the sign he had promised them. His body was laid to rest in the Chapel of St. John the Baptist, which he had built to replace the altar of Apollo. That cave in which he first dwelled [at Subiaco], even to this very time, works miracles, if the faith of those that pray there requires the same. For the thing which I mean now to rehearse fell out lately. A certain woman falling mad, lost the use of reason so far, that she walked up and down, day and night, in mountains and valleys, in woods and fields, and rested only in that place where extreme weariness enforced her to stay. On a day it so fell out, that albeit she wandered at random, yet she missed not the right way: for she came to the cave of the blessed man Benedict: and not knowing anything, in she went, and reposed herself there that night, and rising up in the morning, she departed as sound in sense and well in her wits, as though she had never been distracted in her whole life, and so continued always after, even to her dying day. GREGORY: Where the holy martyrs lie in their bodies, there is no doubt, Peter, but that they are able to work many miracles, yea and also do work infinite, to such as seek them with a pure mind. But for as much as simple people might have some doubt whether they be present, and do in those places hear their prayers where their bodies be not, necessary it is that they should in those places show greater miracles, where weak souls may most doubt of their presence. But he whose mind is fixed in God, hath so much the greater merit of his faith in that he both knows that they rest not there in body, and yet be there present to hear our prayers. And therefore our Saviour himself, to increase the faith of his disciples, said: "If Ido not depart, the Comforter will not come to you," [John 16:7]: for, seeing certain it is that the comforting Spirit does always proceed from the Father and the Son, why does the Son say that he will depart that the Comforter may come, who never is absent from the Son? But because the disciples, beholding our Lord in flesh, always desired to see him with their corporal eyes, very well did he say to them: "Unless I do go away, the Comforter will not come:" as though he had plainly told them: If I do not withdraw my body, I cannot let you understand what the love of the spirit is: and except you give over [cease] to love my carnal presence, never will you learn to affect me with true spiritual love. PETER: That you say pleases me very well.